My name is Marie, and I am so happy to be one of your co-guides for WDW: Staying in Style and Going Behind the Scenes, as well as the Backyard. I am happily married to the man who started my Disney addiction, my wonderful husband John, and have been for almost 25 years. We have 3 beautiful daughters - Amanda (21), Jennie (19) and Sarah (13) - who most of you have seen in many pictures over the years in this community. We live in the White Mountains of NH, and are very involved in all aspects of our community. I am a special education teacher and have just started teaching 4 sessions of preschool (2 groups each of 3 year olds and 4 year olds). It's a big switch from the self-contained classroom for emotionally handicapped children that I had taught in for the last five years. I've come a long way from my original career path as an accountant - but I just love to teach! I am also attending graduate school part time to complete my master's degree. My husband John works as an engineer at a wood-fired power plant here in town, but his first love is emergency services - he is a volunteer firefighter, EMT-I, and part-time police sergeant, as well as being a nationally certified instructor for all of those disciplines! I have been addicted to Disney ever since my first trip in 1986, on our honeymoon. We stayed at the Contemporary, in a Magic Kingdom view Tower room, (The only other hotels were the Polynesian and the Golf Resort at that time!). Thus my screen name - CRCrazy! We did take a long time off - but when we returned with our girls - we did so with a vengeance! Since we are a family of five - I've got extensive experience with the deluxes (BIG ROOMS! ), and I've stayed at both the All-Stars and Pop Century several times each on trips with fewer members of the family. Now that my older two girls are grown - we've finally done a family trip to WDW with only 4, so I finally stayed at my first moderate resort in December of 2008. Port Orleans French Quarter was our first moderate stay - and I fell in love with this resort! 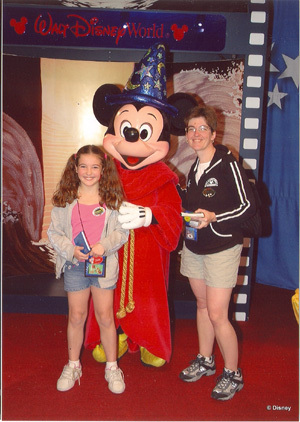 While I don't have many photos of me - I'm usually behind the camera - here's a shot of my youngest daughter Sarah and I with Sorceror Mickey scanned from a Photopass shot from Mousefest 2005. I also love to travel - and go to PassPorter Meets! 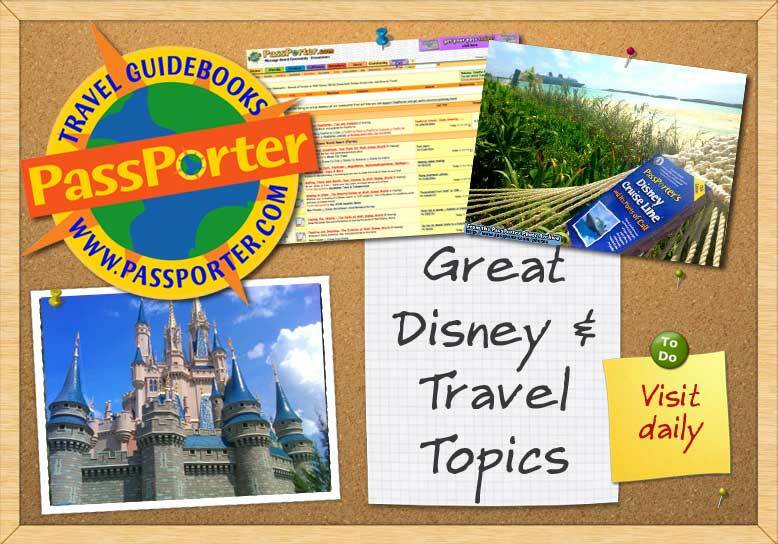 I've met Passporters in Boston, Connecticut, and even Philadelphia and Allentown PA, as well as at WDW itself. I'm really excited to have been privileged to meet so many Disney fans, and have made some good friends along the way.